Since the early days of the Gartner Magic Quadrant for this category, there have been successive waves of innovation. Back in 2002, integrated firewalls captured the market’s (and Gartner’s) attention. Over the years, we’ve seen technologies, such as full disk encryption, data loss prevention (DLP), behavioral detection, application control, and more recently, machine learning, as effective new ways to protect endpoints, detect threats and give security teams peace of mind. Trend Micro has consistently been part of these innovation waves. 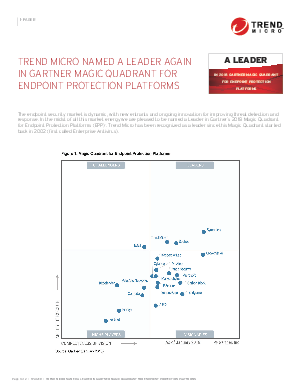 It’s clear that the market is excited about Endpoint Detection & Response (EDR). There are two drivers for this, and we are committed to delivering effective solutions in both areas.